How can we think "outside the box" to make improved customer experience a reality? History shows us how different thinkers and doers from all fields, whether it is science, literature or engineering have made valuable contributions to the human development because they dared to challenge the reality. Christopher Columbus, Leonardo Da Vinci,Einstein, Dr. Rene Favaloro, Steve Jobs and Mark Zuckerberg to mention just a few, had the courage to build unconventional solutions. Thinking outside the box means daring to conceive of perspectives and realities that go beyond what is known, what is rationally possible and creates real innovations. Outside-the-box thinking refers to creative thinking. It requires a willingness to go beyond normal boundaries and usual approaches. Some companies, such as Blockbuster or taxi companies in general have remained inside the box. As a result, they have disappeared or their competitive spectrum has been put at risk. 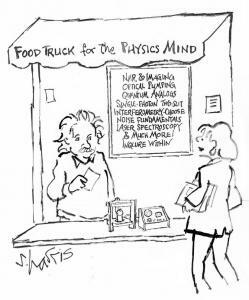 Outside-the-box thinking is a competence highly valued by the labor market and although deeply sought after it is not always found. All great discoveries such as fire, the wheel, medicine, commercial space travel or drones that transfer blood or food to a hospital in Africa are the result of people who dared to challenge the status quo. Have you ever wondered what makes the difference between disruptive and traditional managers? Disruptive managers can find answers to unsolved problems. They dare to take risks, they are adventurous, and they continue in spite of difficulties, they aim to beat the market without fear of trying new things. But these abilities can be stifled sometimes. Organizations frequently make decisions based on financial data, which is necessary, but it is not the only data to consider. Breaking the mold and navigating through the customer’s preferences, creating new demands, discovering untapped opportunities. Therefore, if the value of people who think outside the box were considered, decisions would be more customer-oriented and companies would become more profitable and competitive. Breaking the box means daring to think of different scenarios that will allow us to break away from logic and to remove, replace and intensify thoughts and actions that will strengthen leadership. Innovative companies encourage their customer facing staff to make decisions by sharing their viewpoints with other support areas. This outside-the-box model motivates staff, it calls upon them to have dynamic perspectives and to find solutions from a menu of options. This fosters flexibility and allows them to comply with processes faster or to create new ones with fewer resources and delivering better results. When we manage to make staff feel that they “belong”, their tasks come to life, and they give us their commitment in return. But when they only have to comply with the procedures required by the company, it is difficult to achieve extraordinary results. Allowing ourselves time to listen to our collaborators, to understand their difficulties, to accompany them in setting shared goals and giving them freedom to map out a path fosters a sense of belonging. In this way, it is easier to spot the lighthouse at the tip of the peninsula, to sail through ambiguous and uncertain waters, to dissipate the fog of the market in order to transform the future and reach a safe harbor: the holy grail of business, leadership and profitability. How to broaden the spectrum to entice customers? The big challenge is to create and sustain a proposal of Value, since it is a springboard to enticing customers. •	Deepening our Self-awareness by identifying how our development is being hindered: beliefs, prejudices, rigidness preconceptions. •	Knowing the best practices in industries other than ours. Reading articles, blogs, notes, cases produced by different sectors to learn from them. In summary, opening our minds to knowledge and accept something different to emulate it or improve it. •	Reinventing ourselves in knowledge. Exploring knowledge that has nothing to do with our field of expertise: gardening, dancing, flying drone, trying something new. •	Nurturing ourselves with innovative and interesting resources: films that cover different genres, science fiction books, graphic novels, adventure stories about heroes and villains, different resources that can be helpful to analyze how aversion to change can be overcome. •	Starting with the goal and going backward: Analyzing the steps taken to go through the whole process, evaluating what was done well and what needs to be changed. •	Playing games: Daring to become a child and play with our hands, assemble models, build sand castles. This is important to observe their capacity to solve problems quickly and their different way to achieve results and their ability to start over. According to the Missioncouncil.se (2019) AHA Moment is: "The outside spiritual force that provides the breath of life, the spark of consciousness and synergy"
How to know if we are inside or outside the box? Outside-the-box thinking must be based on Self-awareness if we are to lead others, whether our teams, suppliers or customers. Melinda Fouts (2016) highlights that we can use two instruments to develop self-awareness – Emotional Quotient Inventory (EQi – 2.0) and Myers Briggs Type Inventory (MBTI). These assessments complement each other. The first one explores 15 competences while the second one facilitates personal knowledge growth and shows us how interact with others. If we want to win customers, it is essential to analyze situations with an open and exploring mind. 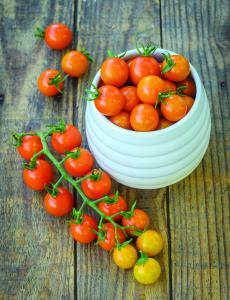 Honeycomb Tomato from Burpee produces dozens of flavorful golden-orange cherry tomatoes. 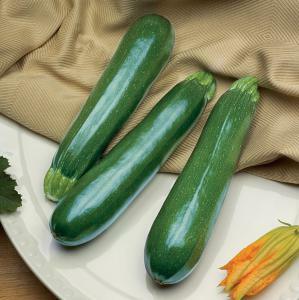 Spineless Perfection Zucchini is a new hybrid with delicious flavor and greater disease resistance. ‘Slovana’ Pepper produces a nonstop crop of tasty, neon-golden sweet peppers. For 2019, seed companies have introduced an impressive selection of new vegetable seed varieties including new tomatoes, peppers and zucchini. COLORADO SPRINGS, COLORADO, UNITED STATES, February 15, 2019 /EINPresswire.com/ — Every spring, gardeners begin to dream of a new gardening season. Seed catalogs and websites bring the promise of a bountiful crop of new vegetable seeds and plant varieties to grow. This spring is no different, with lots of new vegetable varieties and seed collections to entice new and experienced gardeners alike. For 2019, seed companies have introduced an impressive selection of new vegetable seeds. Some of these new vegetable varieties put a new spin on garden favorites. Others bring back heirloom selections that have a long history of outstanding garden production. Sometimes the best new vegetable seeds offer bigger harvests and better hardiness. Sometimes the appeal is a different color, or a new variety designed especially for small gardens or container growing. Here is a roundup of the best new vegetable varieties for gardeners and lovers of fresh garden produce. Cherry tomatoes are a popular choice for backyard vegetable gardens. These vining plants produce a huge harvest of small tomatoes that start ripening in mid-summer keep coming until the first frost. Honeycomb Tomato gets its name from the profusion of sweet golden-orange cherry tomatoes each plant produces. The vines grow 6-7 feet long and the clusters of fruit are 12-15 inches long. The petite golden-orange tomatoes are full of flavor—and they have a sweet taste that is reminiscent of honey. The bite-sized ½ ounce tomatoes are perfect for adding to salads or for snacking right off the vine. A packet of seeds sells for $6.99 or three starter plants sell for $18.99 from www.burpee.com. Zucchini Spineless Perfection is a new hybrid variety that combines the tasty flavor of the popular Spineless Beauty with the added benefit of greater disease resistance. Spineless Perfection is resistant to powdery mildew, watermelon mosaic virus and zucchini yellow mosaic virus. The plants are very easy to grow, and the fruits are easy to harvest. Zucchini Spineless Perfection produces delicious fruits that are great when sautéed or roasted on the grill—and are scrumptious when used for zucchini bread, zucchini noodles, and more. Zucchini Spineless Perfection is a fast-growing variety that will start producing delicious zucchinis just 40 days after planting. Sow the seeds one inch deep directly into garden soil after the danger of frost has past. A packet of seeds sells for $3.95 from www.parkseed.com. Peppers are dependable producers in a backyard garden. Fresh homegrown peppers are a delicious addition to salads and veggie trays, and peppers can be used to enhance a wide range of cooked dishes. 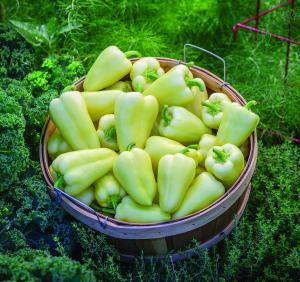 A ‘Slovana’ Pepper plant produces a nonstop summer harvest of tasty, neon-golden sweet peppers. This new variety is a compact grower, with plants reaching just 17-26 inches tall. These plants fit nicely into small garden spaces and also grows well in containers. A ripe ‘Slovana’ pepper is 6 inches long and 2 inches wide that starts out light green in color but matures to a handsome pale yellow. The 4½-ounce fruits boast a rich pepper flavor with a delicate sweetness that’s delicious both fresh or roasted. A packet of ‘Slovana’ Pepper seeds sells for $6.29 or three starter plants sell for $18.99 from www.burpee.com. It’s time for Butter Beans (also commonly know as lima beans) to make a well-deserved comeback. Sieva Carolina Butter Beans are an heirloom variety dating back to the early 19th century. According to historical records, Thomas Jefferson, the third president of the United States, grew them for their excellent flavor. Sieva Carolina Butter Bean plants produce an abundant crop of tender, creamy-white beans This variety is cold resistant, so it can be planted early in the season. It’s also a fast-bearing pole bean that produces just 65-80 days from sowing seeds in the garden. And the beans keep coming and coming until the first frost. A packet of seeds sells for $2.50 from www.landrethseed.com. There’s nothing wrong with orange carrots. But sometimes the best new vegetable seeds for your garden are something completely different. Take the Rainbow Blend Carrot seeds for example. This combination of heirloom garden seeds contains carrots in a literal rainbow of colors. They can be harvested as gourmet baby carrots, or they can be grown to their full mature size. This assortment includes these varieties: Atomic Red, Cosmic Purple, Solar Yellow, Lunar White and Bambino. Every one of these varieties looks and tastes great. A packet of seeds sells for $2.75 from www.willhiteseed.com. Larger quantities of seed are also available for larger gardens. Gardeners who live in a cold climates often start seeds indoors well before the last frost date. This gives them a jump-start on their gardens, which can increase the yields of plants such as tomatoes and peppers. To give seeds the best possible start, plant them in a biodegradable and natural seed-starting pot. CowPots seed-starting pots are made from composted cow manure from a dairy farm in Connecticut. (Hence the name, CowPots!) These natural pots allow seedlings to grow a bigger root mass, which results in healthier plants. Using these biodegradable pots eliminates transplant shock because the entire pot can be planted in the ground. Plus, the CowPots naturally decompose to provide nutrients for the plant. CowPots are available in a wide range of sizes at fine garden centers and online at TrueValue.com and Amazon.com. WiseGuyReports.com has been added report of “Direct Selling in the US” to its Research Database. PUNE, MAHARASTRA, INDIA, February 14, 2019 /EINPresswire.com/ — WiseGuyReports.com has been added report of “Direct Selling in the US” to its Research Database. The Direct Selling in USA report offers insight into key trends and developments driving the industry. The report examines all retail channels to provide sector insight. Channels include hypermarkets, supermarkets, discounters, convenience stores, mixed retailers, health and beauty retailers, clothing and footwear retailers, furniture and furnishing stores, DIY and hardware stores, durable goods retailers, leisure and personal goods retailers. There are profiles of leading retailers, with analysis of their performance and the challenges they face. There is also analysis of non-store retailing: vending; homeshopping; internet retailing; direct selling, as available.